Born on 29 December 1952 in the working class suburb of Carlton in southern Sydney, Stephen Loosley was the son of clothing worker Bernard Alan Loosley and his wife Jean Elizabeth, née Pike. The eldest of three children, Stephen was educated at Carlton Public School before winning a place at the selective Sydney Technical High School in 1965. Between 1972 and 1975 he undertook a Bachelor of Arts degree at the University of New South Wales, graduating with first-class honours in political science. He married Lynne Davidson, a former school teacher, on 9 February 1985 and they had two sons. In September 1970 Loosley witnessed a violent confrontation between police and student demonstrators during a Vietnam Moratorium march in Sydney, pushing him 'firmly onto the Left of the political spectrum'. He joined the ALP in 1972, inspired by Labor leaders Gough Whitlam and Neville Wran. His strong left-wing student record of protest against the Vietnam War and apartheid made him stand out as a Labor prodigy and marked the beginning of a long and eventful career in the party. Encouraged by Tom Hanratty, a Labor alderman on Rockdale City Council, Loosley joined the Carlton/West Kogarah Branch of the ALP and was soon 'actively engaged in the inner workings of the party's Left' at the local branch level. He also met Graham Richardson, then an organiser for the NSW ALP, who became a mentor and close friend. Loosley was appalled by the vehemence of the attacks of NSW left-wingers on Prime Minister Whitlam, following the sacking of Deputy Prime Minister and Treasurer Jim Cairns, in July 1975. As a result he became disillusioned by the attitudes and motives of the left and decided to give up politics to finish his undergraduate degree and consider a PhD. However, the November 1975 dismissal of the Labor Government compelled Loosley to put his academic plans on hold. Instead, as secretary of the party's St George federal electorate council, he worked towards getting his sitting member, the Minister for Defence, Bill Morrison, re-elected at the December 1975 election, but was unsuccessful. In early 1976 Loosley was offered a job as research officer to newly-elected Labor Senator Kerry Sibraa, an offer orchestrated by Richardson. After some deliberation Loosley accepted the position and also joined the right-wing faction of the party. The left faction regarded his defection as a betrayal, with some members holding it against him for the rest of his political career. Working for Sibraa, Loosley received a thorough grounding in Senate procedures and traditions, and in factional Labor politics as practised by a leading member of the right. In 1977, after only eighteen months with Sibraa, he was appointed to the position of party organiser, and in 1979 he became assistant general secretary of the NSW branch. In 1983 he succeeded Richardson as general secretary of the state party, holding the post for the next seven years. In 1989 he was appointed a senior national vice-president of the ALP and two years later he was elected ALP national president at the ALP's National Conference in Hobart after an acrimonious factional contest in which a tied result between himself and Barry Jones MHR was eventually resolved by Jones withdrawing from the ballot. Loosley's progress to the top of the party organisation was not always smooth. In 1988 he failed to disclose a ten thousand dollar donation made in support of the party's 1987 federal election campaign, and the following year he was fined two hundred dollars for filing an incomplete electoral return, though he successfully appealed the decision. In the same year questions were raised about another election donation, but Loosley was again reprieved when the Independent Commission Against Corruption (ICAC) found he had not breached the law but had circumvented it—in 1988 Loosley and Richardson had strenuously opposed the setting up of ICAC, and two years later, shortly after entering the Senate, Loosley called for ICAC's abolition. The issue which dogged Loosley the most throughout his Senate career was the purchase of a building in 1990 to house the future headquarters of the NSW Labor Party. As general secretary of the branch, Loosley was responsible for recommending a property. After the state administrative committee had approved the expenditure, the building was acquired for $3.8 million. Due to a sudden collapse of the Sydney property market, the Sussex Street property more than halved in value, but the loan used to purchase the property still needed to be serviced at an interest rate nearing twenty per cent per annum. The NSW branch of the party fell into deep debt, from which it struggled for years to recover, and Loosley was deemed the culprit. The resentment towards Loosley was so bitter that he was forced to resign the national presidency of the party after only one year. 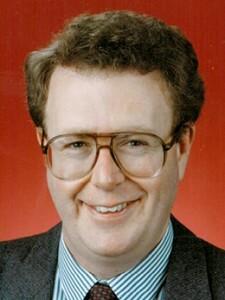 Loosley was elected to the Senate at the head of Labor's NSW Senate ticket on 24 March 1990, and his term began on 1 July 1990. In his first Senate speech on 21 August 1990 he voiced support for Australia's condemnation of Iraq after it had invaded Kuwait and praised the decision to send Australian ships to the Persian Gulf to help enforce UN sanctions. Five months later he reiterated his support for the government's policy on Iraq, speaking in support of military intervention. Loosley's early years in the Senate coincided with prolonged struggles for the Labor leadership between then Treasurer Paul Keating and Prime Minister Hawke. As president of the party, Loosley sought to remain impartial, pleading for peace and warning that the very public brawling would tear the party apart. In each of the two leadership spills in 1991 Loosley backed Keating. Through his committee service Loosley made a strong and positive impression 'in a very short space of time', particularly on the Joint Standing Committee on Foreign Affairs, Defence and Trade (JFADT), which he chaired from May 1993 to May 1995. In 1990 Loosley was a member of an inquiry by the Senate Standing Committee on Foreign Affairs, Defence and Trade into the implications for Australia of perestroika, the political and economic reform process initiated by Mikhail Gorbachev in the USSR. In December 1993, Loosley joined a team of international observers engaged to monitor the Russian elections. In May 1990, he had played a similar role during the first democratic elections held in Nepal in over thirty years. On more than one occasion, Loosley spoke to the political situation in South-East Asia. In 1992 he successfully moved that the Senate note the continuing refusal of the military regime in Burma (now Myanmar) to implement the results of the May 1990 election, the continuing detention of Aung San Suu Kyi and other political figures, and the widespread abuse of human rights within Burma, including systematic abuse of minority ethnic groups. Also, from March 1994, he chaired a JFADT inquiry into human rights violations and the lack of progress towards democracy in Burma. In November 1993, when tabling the JFADT report Australia's Relations with Indonesia, Loosley referred to human rights in Indonesia as 'the most difficult and sensitive' subject affecting its relationship with Australia. Loosley was also the chair of the JFADT sub-committee on human rights. In this capacity, he tabled a JFADT report into human rights in Australia. In his tabling speech he explained that the 'committee believed it was important that Australia should look closely at its own record, and not be complacent'. He also observed that although 'Australia's record on the ratification of human rights treaties' was 'formidable', there had been 'only intermittent parliamentary debate or scrutiny' of 'the process of signing and ratification'. He went on to express the committee's 'firmly held belief that continuous, open and free dialogue and debate between nations on human rights issues must be maintained.' Loosley's work on the human rights sub-committee prompted his deputy chair, Liberal Senator Baden Teague, to say of Loosley: 'I do not know any member of the current parliament who has made a greater contribution and shows such diligence with regard to human rights anywhere in the world'. Foreign Minister Gareth Evans spoke warmly of Loosley's 'most significant' contribution to foreign policy and his 'very capable and sensitive leadership' of key parliamentary delegations that dealt with 'some very intractable problems', instancing Loosley's work as chairman of the Australian parliamentary delegation to Papua New Guinea in April 1994. The delegation's visit to Bougainville during the drawn out war between separatist rebels and Papua New Guinea's armed forces led to constructive peace talks which in turn eventually helped to bring hostilities to an end. Loosley led an Australian parliamentary delegation to Vietnam aimed at initiating 'substantial dialogue on human rights issues', in April 1995, a year after a planned delegation had been cancelled due to a disagreement with the Vietnamese Government about the proposed itinerary. On his second last day in the Senate, Loosley tabled the delegation's report, which included a note that exchanges with the Vietnamese authorities 'were sometimes robust'. Although Loosley dedicated a good deal of time to foreign affairs and human rights, he spoke to a wide range of issues. In 1994 Loosley publicly criticised the work of the Senate Select Committee on Print Media, which inquired into the processes of the Foreign Investment Review Board and investigated whether the government had allowed Fairfax to increase its levels of foreign ownership in 1991 and 1993 'in return for balanced coverage' in its newspapers. Loosley argued that the majority of the committee had 'walked over many of those concepts of liberty which are fundamental to Australian democratic practice'. In the Senate he accused the committee of producing 'unsubstantiated smears', calling it 'an absolute farce'. In June 1994, following Opposition comments about the personal conduct of Graham Richardson, Loosley argued that parliamentary privilege should be curbed so as to prevent the deliberate 'trashing of the reputation of private citizens'. He suggested that people who believed that they had been defamed under parliamentary privilege should be permitted to take civil action, allowing the courts to determine whether or not the right of privilege had been abused. On 27 March 1995 Loosley informed the Senate of his intention to resign, citing a desire to pursue a career in law. He had been offered and had accepted a job with a leading law firm. He also cited family reasons: his constant absences from home were affecting his relationship with his children and he wished 'to re-establish a family life where separation in different cities becomes a feature of the past'. He later informally acknowledged that he felt that it was not worth putting his family through another round of public political faction fighting to prolong his political career, especially given the party's continuing ill-feeling over the purchase of the building to serve as the headquarters of the NSW Labor Party, and the Keating Government's decline in opinion polls. In the Senate, Loosley was a strong believer in seeking out and then applying a bipartisan approach. He praised 'the degree of informal bi-partisanship which exists outside the rigidities of the chamber' and the 'camaraderie of Senate life'. After leaving the Senate, he noted his beliefs that when 'a consensus is formed, the national interest stands to benefit' and 'negotiating with people allows a better understanding of them'. Loosley used his valedictory speech to note his appreciation of the 'generosity of spirit' shown by senators of all political persuasions in their valedictories. He also used his speech to call on the Senate to involve itself in three distinct issues, notably, establishing an Australian republic with an Australian head of state, instituting a bill of rights and setting up a joint standing committee on Australian human rights. Immediately after leaving the Senate, Loosley's attention shifted to completing his law degree, which he had commenced in 1993; he graduated with first class honours in 1997. He was also the director of the international and trade law division of the law firm of Dunhill Madden Butler (1995–96) before he was made partner in 1996. He remained as a partner of the firm through its merger with Price Waterhouse Coopers Legal in 1999 but left in 2006 to take on the role of strategic adviser to the investment firm Babcock & Brown Ltd. In 2009, when that company was liquidated, he moved to Minter Ellison Lawyers, where he worked as strategic counsel until 2015. He has been a published author, a book reviewer for The Australian and The Spectator Australia and a regular media commentator on Australian and US politics. Loosley has also held a number of executive positions, such as chair of the Committee for Sydney (2003–11), the Australian Strategic Policy Institute (from 2008) and the Wommera Prohibited Area Advisory Board (from 2013). He was also a senior vice president of the European Australian Business Council (2010–14), a deputy chairman of the Asia Society Australia (from 2012) and a board member of the National Rugby League (2001–12), the St James Ethics Centre (from 2008) and the Salvation Army (from 2008). In 2015 he was appointed a Member of the Order of Australia. In Senate valedictories Independent Senator Brian Harradine (Tas.) praised Loosley's debating skills, stating that he had always 'made a jolly good fist of it and defended what was indefensible on many occasions'. Harradine also acknowledged Loosley's skill in chairing committees and his capacity to maintain a level head, even 'in the face of provocation'. Liberal Senator Ian Campbell (WA) judged that Loosley's departure meant that the Senate was 'losing one of its most effective people', while Labor colleague Senator Barney Cooney managed to sum up the sentiments of the valedictories by characterising Loosley as 'a man of grace, intelligence, industry and integrity'. Throughout this entry the author draws on information gleaned from her interview with Stephen Loosley. Stephen Loosley, Machine Rules: A Political Primer, MUP, Carlton, Vic., 2015, pp. ix–xii, 1–3, 6, 9–14; SMH, 27 March 1995, p. 5, 29 Nov. 1991, p. 13, 8 June 1992, p. 5; 'Profile: Senator Stephen Loosley', House Magazine, 10 July 1991, p. 3; Transcript, ABC Radio, 'Ring the Bells', 20 April 1990. Loosley, Machine Rules, pp. 12, 185–6; House Magazine, 10 July 1991, p. 3; SMH, 29 Nov. 1991, p. 13, 8 June 1992, p. 5, 9 Feb. 1993, p. 11, 27 March 1995, p. 5; Australian (Syd. ), 16 Aug. 1990, pp. 1, 2, 17 Aug. 1990, pp. 1, 2; CT, 7 June 1992, p. 2, 28 March 1995, p. 5. CPD, 21 Aug. 1990, pp. 1840–4, 21 Jan. 1991, pp. 72–6, 5 June 1991, pp. 4403–4; Australian (Syd. ), 8 Nov. 1991, p. 1; SMH, 8 Nov. 1991, p. 1. CPD, 11 May 1995, pp. 374–6, 395–8, 15 Dec. 1993, pp. 4664–5, 1 April 1992, pp. 1444–5, 18 Nov. 1993, pp. 3170–6, 26 Oct. 1995, pp. 2572–3, 5 Dec. 1994, pp. 3905–11; Standing Committee on Foreign Affairs, Defence and Trade, Perestroika: Implications for Australia-USSR Relations, Canberra, Dec. 1990; Media Release, Senator Gareth Evans, 6 May 1991; Joint Standing Committee on Foreign Affairs, Defence and Trade, A Report on Human Rights and the Lack of Progress Towards Democracy in Burma (Myanmar), Canberra, Oct. 1995. CPD, 11 May 1995, pp. 374–6, 8 June 1994, pp. 1470–6, 30 Aug. 1994, pp. 557–8, 10 Oct. 1994, pp. 1299–300, 10 May 1995, pp. 187–90; CT, 20 July 1994, p. 3. Select Committee on Certain Aspects of Foreign Ownership Decisions in Relation to the Print Media, Percentage Players: The 1991 and 1993 Fairfax Ownership Decisions, Canberra, June 1994, p. xviii; CPD, 9 June 1994, pp. 1567–9; CT, 16 June 1994, p. 13, 13 June 1994, p. 2. CPD, 27 March 1995, pp. 2113–4, 11 May 1995, pp. 395–8; CT, 28 March 1995, p. 5; Loosley, Machine Rules, pp. 40–3; Australian Business (Melb. ), 30 June 1991, pp. 50–2. Daily Telegraph (Syd. ), 1 Oct. 1997, p. 13; Loosley, Machine Rules, pp. 193–4; CPD, 11 May 1995, pp. 378–9, 381, 387–9. This biography was first published in The Biographical Dictionary of the Australian Senate, Vol. 4, 1983-2002, Department of the Senate, Canberra, 2017, pp. 115-119.